Caracal Anatomy, habitat, distribution, feeding, reproduction, evolution, social structure, conservation. 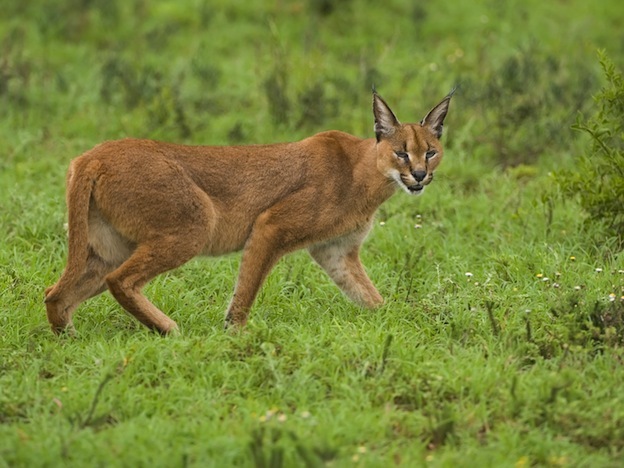 Caracal images, videos and top facts. Among the medium sized felines is the Caracal. It does belong to the small cat family but it is the heaviest one of that group. They are the fastest small cats which gives them plenty of opportunities in the wild. They can be tan in color or a cinnamon mix of browns and reds. They have very large eyes that are light color and that have the formation of circles rather than of just slits like many other felines. This particular cat features black ears which is what the name Caracal means in the Turkish language. The look of this animal often results in it being mistaken for one of the subspecies of Lynx. They weigh from 24 to 43 pounds with the females being on the smaller side of that scale. They are able to walk on the soft sand due to the stiff hairs that grow between the pads on the bottom of their feet. They have a small jaw but one that is very powerful and that features very sharp teeth. Many of them don’t have the second upper premolar teeth. The habitat for the Caracal covers a great deal of Africa and the Middle East. They live in various locations including the woodlands, forests, and the open savannahs where it can be very hot. They tend to stick to areas where they have covering by bushes or rocks. This gives them better opportunities for taking their prey by surprise. The Caracal is a very territorial creature and it will become very aggressive to any types of animals that invade that space. They either live alone or in pairs. The females have a home range that is about 4 – 31 Km sq. The males have a home range that can be four times larger. They use hissing, purring, and growling for communication. They also give a strange barking sound when they need to warn of dangers. The Caracal is a night time hunter. Their food sources include mainly hares, small monkeys and rodents. They also consume birds often. The design of their bodies allows them to leap very high. It is common for them to capture birds that are still in flight. They do have the ability to take down larger animals including the Gazelle or the Antelope. However, this type of behavior is rare as they can usually find enough to eat with the smaller prey. They often go to drink water too but can go for long periods of time without it. The foods they consume offer some water for them. Mating is possible during any time of the year for the Caracal. When there is plenty of food around the female is more likely to go into estrus. She will give off powerful scents that attract males. Males will fight with each other very aggressively for the right to mate. A male will stay with a female for several days, mating often during that period of time. If the mating is a success the female will give birth from 68 to 81 days later. A litter of kittens can range from 1 to 6 and they are very small and vulnerable at birth. They will remain in a den until they are about 1 month old. The average life span of the Caracal is 12 years in the wild. It is about 17 years longer in captivity. It isn’t really known how many Caracal live in the wild. They hide very well and that makes it hard to count them. They are considered to be a nuisance by many because the will kill chickens and small goats or sheep. In the Moscow Zoo the Caracal has been bred successfully with the domestic cat.